It looks and performs like a high-end PJ, but Epson’s EH-TW7400 appeals to Steve May’s wallet too. Read our EPSON EH-TW7400 Review. ‘Badges? We don’t need no (stinking) badges!’ So declared Mexican bandit Gold Hat (Alfonso Bedoya) in The Treasure of the Sierra Madre. He clearly wasn’t an AV fan. We all love badges. And there’s no shortage on Epson’s latest projector, the EH-TW7400:3LCD, 3D, 4K Enhancement, HDR and Pro UHD. The latter is a new one on me. But that’s fine. One of two new Epson models so anointed (perhaps optimistically, given that they’re not native 4K), the EH-TW740 0 is the entry point for this new appellation, and a replacement for last year’s lookalike EH-TW7300. 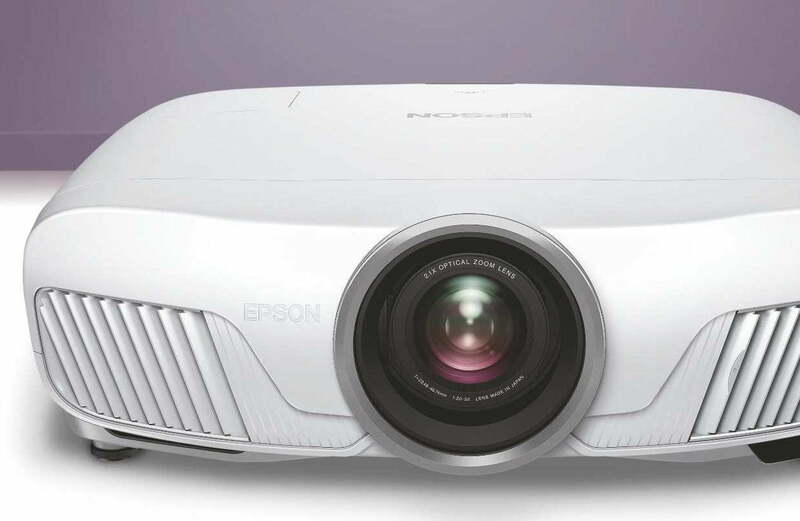 Built around Epson’s stock-in-trade 3LCD image engine, this projector offers more brightness and greater contrast than its predecessor. It claims a dynamic contrast ratio up to 200,000:1, and uses pixel-shifting wizardry to present a 2160p image. 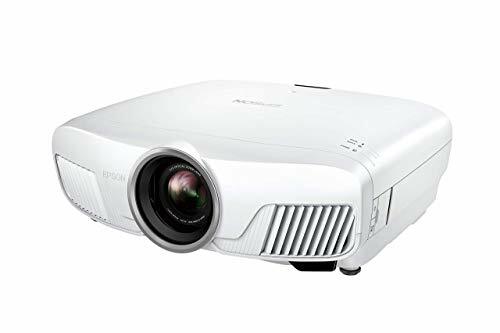 The projector is also able to read HDR10 metadata, although as with all beamers, particularly at this price point, there’s a limit to just how much it can do with it on screen. 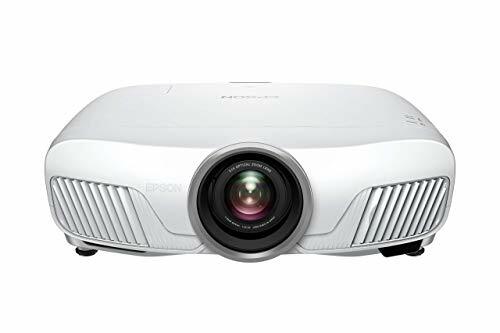 The model is larger than Epson’s current EH- TW6700/680 0 Full HD series, so don’t plan on using one for impromptu screenings from a coffee table. It’s unapologetically about home theatre, and warrants a permanent installation. As we’ve come to expect from the brand, build quality is excellent. The matt white chassis features a centrally- positioned lens, with a flashy bronze accent, and cooling vents sit either side of the automated shutter. The backlit remote control is a standard Epson accessory; large but easy to wield in a darkened room. If you want on-body control, there are menu buttons hidden behind a sliding door to the side. Connections are recessed around the back. These include two HDMI inputs, but only one is blessed with HDCP 2.2 copy protection for use with UHD sources, which is a bit of a disappointment. Furthermore, 4K/60p 18Gbps transmission is off the menu too (it’s reserved for the step-up EH-TW9400 series). Motorised optics lend the EH-TW7400 a premium edge. A 2.1x optical zoom, powered focus and powered lens shift means you can line the image up and snap it perfectly into focus with just the remote. Generous lens shift options are +/- 96.3 per cent vertical and +/- 47.1 percent horizontal. The throw ratio of 1.35-2.84:1 is also expansive. The PJ will cast images up to 300 in, and you’ll need a minimum projection distance of 3m to fill a 100 in screen. For advanced theatre installs, there are ten memory slots to store different screen aspect ratios. Getting to grips with this Epson is fairly straightforward. 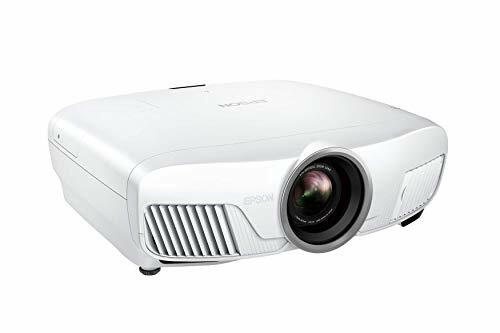 In addition to the usual tabbed text box menu, seen on countless Epson projectors previously, there’s a Home button which presents a fully graphical screen detailing source inputs, with shortcuts for auto iris, display presets, power and menu. impressive, while obviously down on the laser/LED competition. Epson quotes 5,000 hours in Eco mode, saying this translates to a movie a day for seven years (give or take the odd blockbuster). Most vitally, image quality here is tremendous. I don’t mind admitting that I’m a fan of 3LCD. Single-chip DLP projectors may have the edge when it comes to absolute sharpness, principally because there are no alignment issues, but 3LCD isn’t subject to rainbow fringing, and colour fidelity tends to be excellent. But given the sleight-of-hand processing employed by Epson, just how convincing is its UHD presentation? Well, when fed native 4K resolution tests, the projector’s pixel-shifting delivers a surprising simulacrum. I noted some twitching artefacts with high-frequency detail, but on non-test chart material this wasn’t an issue. The projector offers five levels of 4K Enhancement. 1 and 2 are quite subtle, but upwards of these it becomes incrementally more aggressive. The greyscale takes on a reddish tinge from preset 3 (although again this isn’t immediately apparent with real-world footage). I came to the conclusion that 4K Enhancement on preset 2 was the sweet spot, but I did continue to tinker during the audition. The EH-TW7400 proves a great partner for Sky Q’s standard dynamic range UHD content. Sky One cop show Bulletproof looks crisp and cinematic; colour handling is lush, and there’s no shortage of detail and gloss. 4K Blu-rays look occasionally sharper, but what of the EH-TW7400’s HDR handling? To compare 4K disc and SDR 4K broadcast content, I looped the opening sequence of The Dark Tower, one from UHD Blu-ray, the other UHD from Sky Q. There were differences, but not how you might imagine. The Stephen King adaptation opens with kids playing in a sunlit field. The green expanse, with white roundabout, is surrounded by chalets; a blue sky with white clouds reveals two moons. There’s no overt shortage of pop in either the Sky or 4K disc image, however the HDR picture reveals better black level detail and contrast. An aerial shot of the green confirms superior delineation of the sunlit grass. A tousled-haired kid in a striped tee-shirt looks up. His face, half in shadow, has almost photographic depth, cheek bones and hair clearly defined with subtle shadow detail. The Sky Q SDR presentation has a slightly higher, uniform average picture level, with the result that the same face doesn’t have the same naturalistic look. In every scene, the Epson found and displayed more near-dark detail from the HDR disc, without sacrificing bright highlights, which, in truth, appeared uniform across both sources. The HDR skill here is to open up the contrast range, not to sear your eyeballs. To help maximise detail in sports content, etc, the projector offers frame interpolation. However, image smoothing doesn’t appear to work with 4K material. And if your source component is upscaling HD to 2160p, it won’t work either. Interpolation is available in Low, Normal or High flavours. In Low there are no motion artefacts, while pans are smooth but blurry. Both Normal and High introduce obvious motion artefacts, but do increase the levels of image detail retained. So of the options, Low is the better choice. That said, I would probably opt to leave my sources outputting 4K (native or upscaled) and sacrifice Epson’s interpolation tool. Despite this unit’s size, running noise is pleasingly low. In Eco the EH-TW7400 purrs quietly, and wouldn’t draw attention when surrounded by sound. However, opt for Dynamic mode, and you’ll trigger a commensurate increase in fan noise. For the cash, the EH-TW7400 is in many ways an absolute belter. It delivers bright, contrasty images with stable black levels and a pixel density that replicates the look of celluloid. Feel free to debate Epson’s 4K Enhancement proposition (I’m not seeing the same level of clean detail here as observed on native 4K projectors from Sony and JVC), but the unequivocal truth is that this is gloriously cinematic, and that ultimately trumps resolution concerns. Use the Epson’s RS-232C/12V control to spark this ceiling-recessed projector screen into action. Pure Theatre offers diagonal sizes from 68in to 131in, in 16:9 or 2.35:1 ratio (plus a custom option).